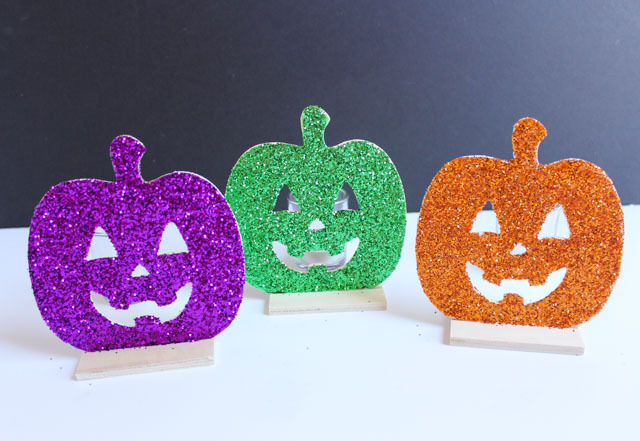 Get the glow of a jack-o-lantern without the hassle of carving with these simple glittery wood pumpkin lights that I made for Oriental Trading! 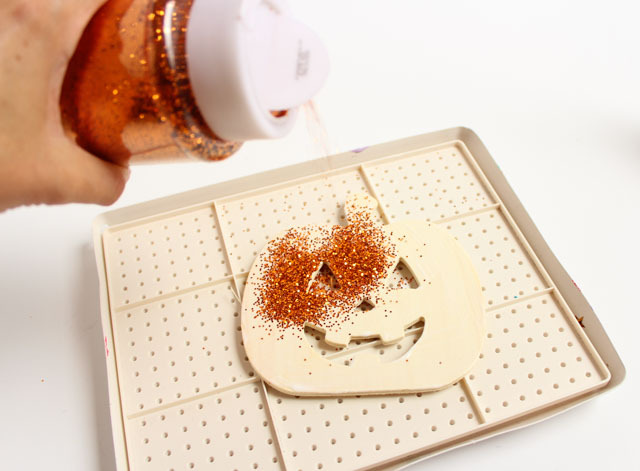 Instead of getting gooey pumpkin pulp on your fingers you can get sparkly glitter instead. So much better, right?! This is a fun craft simple enough for kids to make. 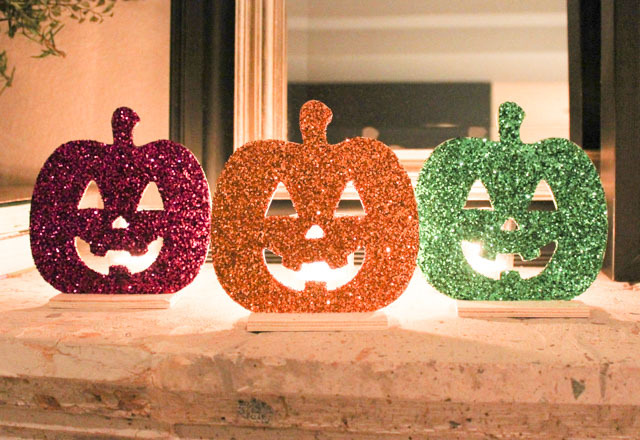 Just cover the wood pumpkin with glitter, slide into its stand, and add a votive candle behind. I love all the DIY wood shapes that Oriental Trading carries. The possibilities are endless for decorating them and making them your own. Plus, they are a very inexpensive way to craft. These wood jack-o-lanterns come in a pack of 12 and are only $1 a piece. Perfect for a group craft activity. If you didn’t want the mess you could always use craft paint and cover it with glow-in-the-dark Mod Podge! Once in awhile I like to get messy with glitter. I found that chunkier glitter worked best for this project and really added to the sparkle at night. Just be sure to use a paper plate or a glitter tray so you can reuse any excess glitter by pouring it back in the jar. 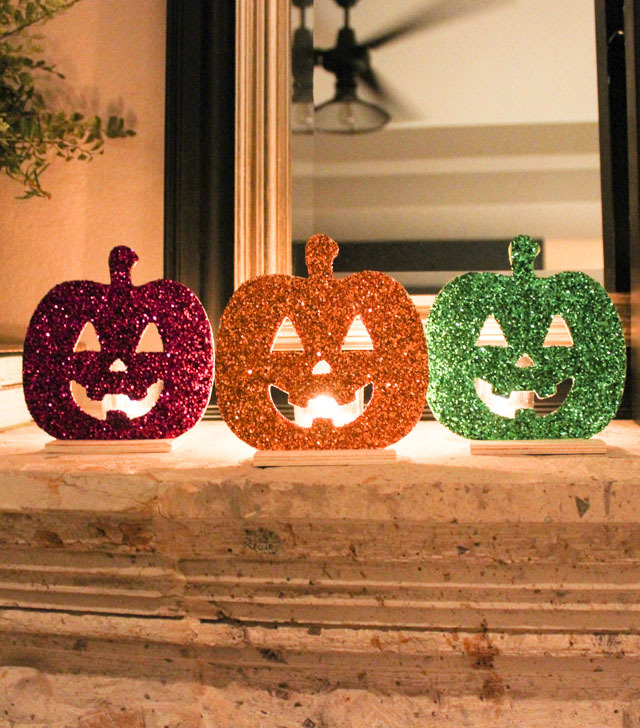 I finished my pumpkins with a coat of polyurethane sealer spray to help prevent glitter from rubbing off. Head to Oriental Trading’s Fun 365 Site for the step-by-step glowing jack-o-lantern tutorial and a full list of supplies!